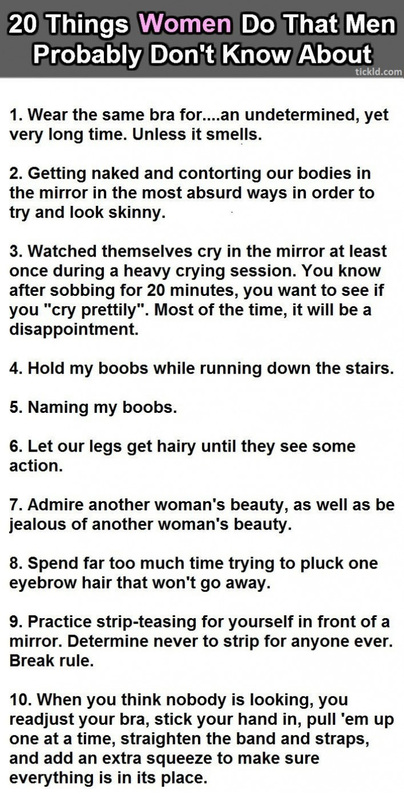 There are some things us girls do that seem ridiculous to men but are totally and logical and necessary to us. For example, we put toilet paper in the toilet before we go as well as after. We tend to keep these things secret from our men, well at least until we are married as it could really lead to major embarrassment. The silly thing is that I am sure there is an even bigger list of silly things men hide from women. I found the image below on tickld.com and thought it was great! I haven’t done all 20 myself but I’m close! Comment below to let us know how many you’ve done!